These are super easy and quick to make. Great with rock fish, tilapia and other white fish. Serve with my Mango Salsa and Jalapeño Cream. I like to use BBQ grill mats with my little gas grill. The fish doesn’t stick and it makes clean up a breeze! 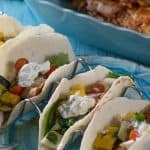 Delicious fish tacos that take absolutely no time to make! Serve with my Mango Salsa , Jalapeño Cream and To Die For Guacamole if desired. Leftover fish can be served over salad or rice. Preheat grill to medium heat. Line grill with BBQ mat. A few minutes and up to 30 min before cooking, sprinkle both sides of fish with kosher salt. Squeeze lime over fish (both sides). Sprinkle, then rub in Chipotle Seasoning over each piece of fish (both sides). I like to use the bbq grill mats on my grill especially for this fish otherwise the fish will stick to the grill. I spray the mat with olive oil spray first then grill over med high heat for about 3-5 minutes. Carefully flip and grill the other side just a minute or so until fish is flakey. Be careful not to overcook. Serve alone, in tacos or over salad. 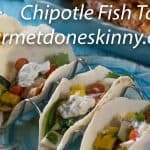 No Replies to "Chipotle Fish Tacos"